This is a “Healthy in a Hurry” recipe. 4-Bean Salad can be prepared in about 20 minutes or less. 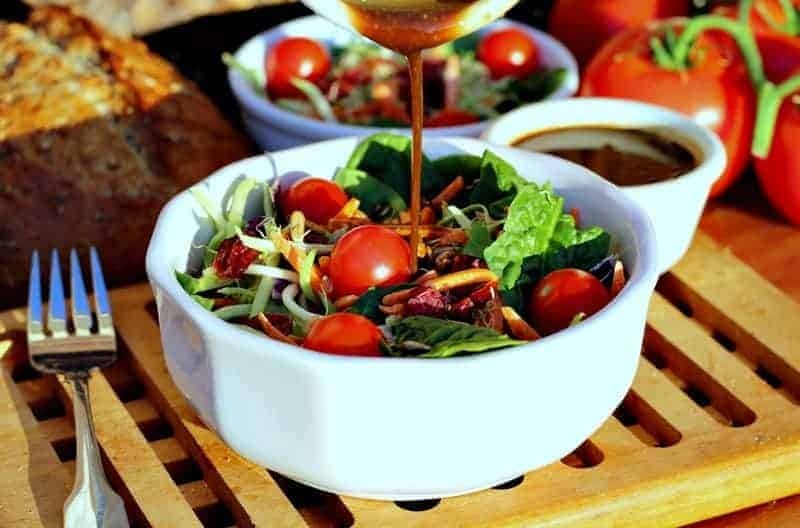 The simplicity and widespread enjoyment of this salad have made it a Food for Life classic for Physicians Committee for Responsible Medicine. 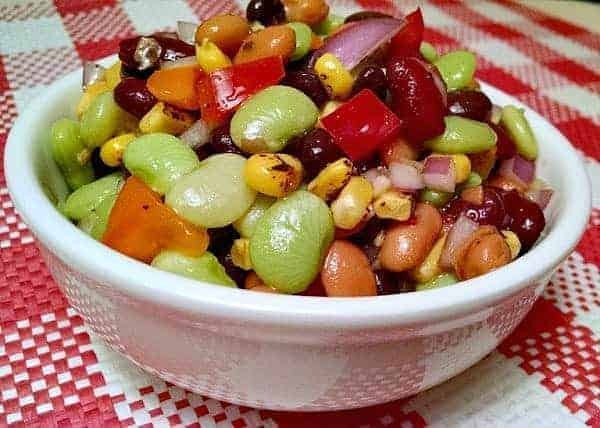 In addition to the four kinds of beans used in this bean salad, we also add corn nibblets, red onion, and red bell pepper. You really can use any type of beans that you like, so the recipe can be adjusted to preference. These are the beans we normally use. 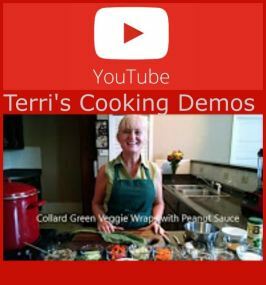 We make this recipe in Cancer Project: Food for Life classes that I teach at cancer centers in Western NC and Upstate SC. 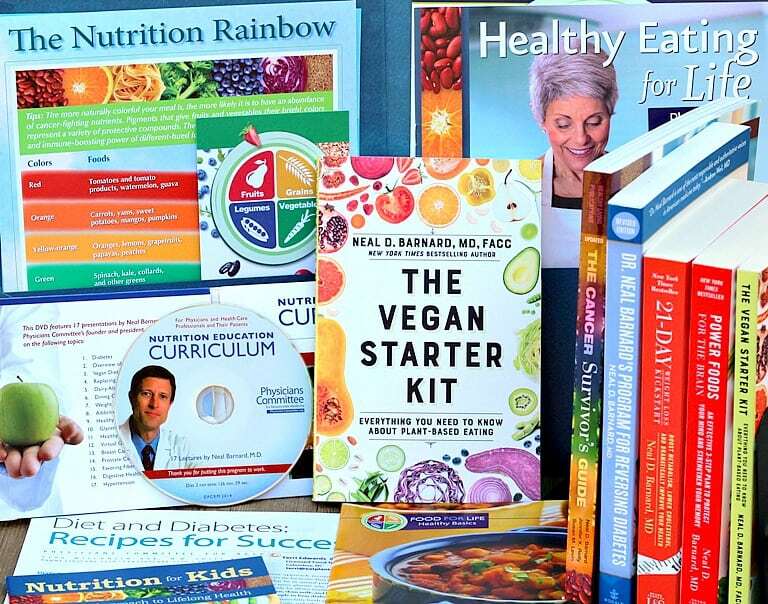 Every single time we make it, participants get excited and empowered, because many of them realize for the first time that eating a healthy plant-based diet doesn’t have to be difficult and can taste amazing. I think the exciting thing for most of them is that this recipe doesn’t call for any cooking. 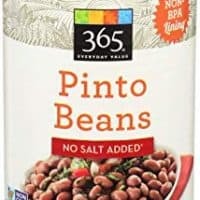 We use can beans that have been drained and rinsed, frozen corn that has been defrosted by running it under warm water while in a colander, freshly diced onions and peppers, and a little Italian oil-free salad dressing. That’s it! Nothing fancy or difficult. 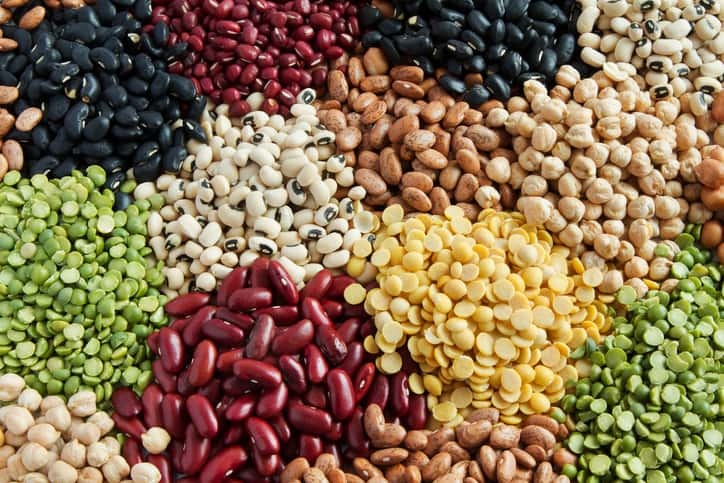 Beans have about 7 grams of fiber per 1/2 cup serving. 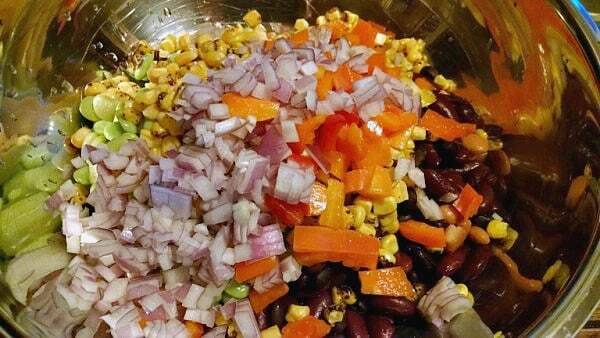 This colorful dish–packed with beans, colorful bell peppers, corn, and red onions–has tons of fiber to help remove carcinogens and excess cholesterol and hormones out of the body to improve overall health. 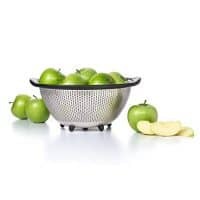 This is a terrific dish to take to social gatherings because it’s so easy to make, and the color makes for a beautiful table display. Recently, the fat-free bottled Italian dressing I used for this began to add a tiny bit of oil. Bummer! So, I decided to try using my Oil-Free, 3-Ingredient Salad Dressing with this recipe. 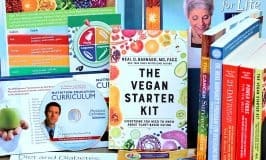 I tried it out on a classroom full of Food for Life participants and they loved it! This is a "Healthy in a Hurry". Easy 4-Bean Salad can be prepared in about 20 minutes. The simplicity and widespread enjoyment of this salad have made it a Food for Life classic for Physicians Committee for Responsible Medicine. Plus it has tons of fiber to help remove carcinogens and excess cholesterol and hormones out of the body to improve overall health! In a large bowl, add all beans. Any frozen corn can be used, but I have found that Trader Joe's roasted corn is excellent in this recipe. 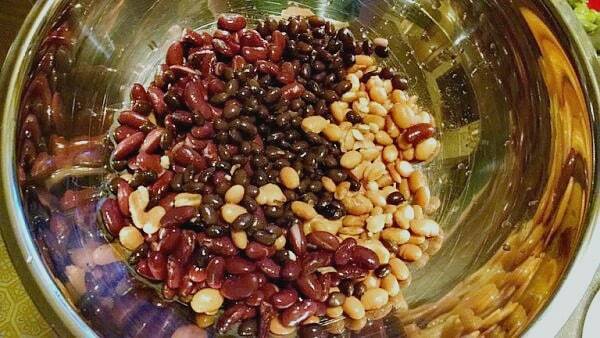 Add all other ingredients to bowl with beans and mix thoroughly. So simple, beautiful, and delicous! This looks great. I have made a similar recipe, and loved it. I forget to use lima beans. This is a great recipe for potlucks. Black eyed peas and lima beans add a unique combination to a bean salad. Just tried this today. It is so simple, easy and delicious! It will be a regular in our meals. That’s wonderful to hear! This is a favorite dish of mine too! How much is a serving? I’d only be making this for one or two people, so it’d be great to know how to portion it out. Thanks! A serving is about 1 cup. This recipe makes quite a lot. To adjust the serving sizes of any of my recipes, simply go to the ‘Servings’ listed in the recipe card right above the ingredients list. 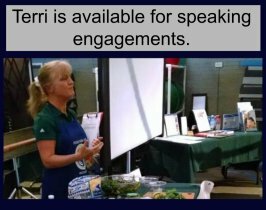 Hover over the number of servings, and a sliding bar will appear. Slide to the number of servings you would like, and the ingredients will automatically adjust the amounts.